Can Rats See In The Dark? 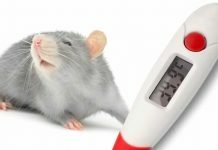 Learn More About Your Rat's Eyesight! 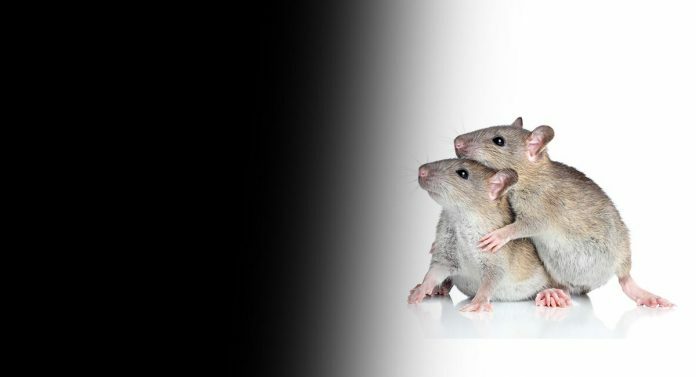 Home Pet Rats Can Rats See In The Dark? In this article, we’ll answer that question for you. We’ll also look at the rat’s natural environment, their diet and predators, and how their night vision – or lack of it – makes them adapted to survive in the wild. But first of all, let’s take a closer look at rat’s eyesight in general. 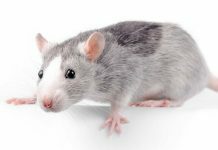 We’re going to mainly focus on the vision of normally pigmented rats – that is rats of colors such as black, piebald or grey. Albino rats are a bit different, and we’ll briefly talk about them near the end. In their eyes, rats have two classes of cone cell, one to sense ultraviolet (UV) light and the other which senses light in the middle of the visible spectrum. The ability to see UV light means they can follow other rats trails of urine, which are easily visible in UV. As is the case with many other mammals, the color vision of rats is limited. They see colors similar to someone with red-green color blindness. For rats, colors appear blurry and faint. Due to the position of their eyes on the side of their heads, rats have a large field of vision, but have poor depth perception. While wild rats and domesticated rats share many common features, pet or “fancy” rats have been bred to be quite different to their wild ancestors. Their vision and foraging behaviors though, are still similar. In the wild, much of the rat’s time is taken up with detecting and avoiding predators like eagles or owls. Rats are prey animals, so their eyes are located on the sides of their heads to give them a wide field of vision. Contrast this with a predators eyes, such as dogs, whose eyes are located toward the front – great for focusing accurately on a potential meal, but within a smaller field of vision. Rats have what is known as binocular vision – they can quickly scan two fields of view to check for predators. Now, let’s take a look at do rats can see in the dark in a bit more detail. The short answer to can rats see in the dark, is no, they cannot. What’s more interesting is the fact that they don’t really need to be able to. As a nocturnal animal, it’s somewhat surprising to us that rat’s night time vision is poor, but in fact they have many other senses at their disposal. Do Rats Like Light or Dark? Rats are actually very sensitive to bright light, which can harm their eyes. So, rats definitely prefer dark or semi-shaded environments. Now we know that a rat’s eyesight is actually pretty poor and they cannot see in the dark, let’s take a look at some of the other mechanisms they use to find their way around. Rat’s whiskers form an incredibly important part of the rat’s ability to navigate. If you watch a rat moving around, you’ll soon see their whiskers are always twitching. Researchers have discovered that these movements seem to be purposeful, and help the rat find their way around new territory. It’s this ability to navigate using their whiskers, which gives them the ability to easily move around both familiar and unknown areas in the dark. Rats also have exceptional senses of smell and hearing. Rats are omnivores, meaning they eat many different types of food. In the wild, this can be an advantage, because they can easily adapt to any environment they find themselves in. But as you’ve probably guessed now, it’s not their eyes which typically lead them to their next snack. Being able to consume such a wide variety of foods can present the danger of ingesting poison. 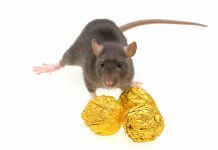 This means that although rats can eat a wide variety of foods, they are actually very careful about what they eventually choose to eat. To identify safe foods domestic and wild rat’s food preferences can be linked to foods their mother ate during lactation and weaning, as well as copying adult rats and eating the same foods as they do. Rats will prioritise eating foodstuffs that they can smell on the breath, fur, and whiskers of other rats. Albino rats have far worse vision than pigmented rats. Their sense of smell is also impaired. This means that they rely much more on their hearing than other rats. Do rats have night vision? No, although it might sometimes feel like yours does! While the rat’s ability to see in the dark is limited, the combination of touch, smell and hearing means they’re able to navigate their way around at night with ease. Is Your Rat An Ace Night Time Navigator? Your rat might not be able to see much after dark, but have they ever surprised you with their nocturnal acts of agility? Bronstein and Crockett. 1976. Exposure to the odor of food determines the eating preferences of rats pups. Behavioral Biology. Jacobs et al. 2001. Cone-based vision of rats for ultraviolet and visible lights. The Journal of Experimental Biology. Sachs. 1996. Penile Erection in Response to Remote Cues From Females: Albino Rats Severely Impaired Relative to Pigmented Strains. Physiology and Behavior. A healthy diet for rats. RSPCA. Rats purposefully use their whiskers in different ways to help navigate in the dark. University of Sheffield. A suitable environment for rats. RSPCA. Arkley et al. 2014. Strategy Change in Vibrassal Active Sensing During Rat Locomotion. Current Biology. Next articleThe Best Gerbil Toys – Tiny Toys With A Big Fun Factor!